The unceasing need for rapid adaptation to the environment give rise to challenges that require companies to customize their management and business models. Flexibility is the key word in these new organizational models. Recently, the concept of the “ambidextrous enterprise” has been gaining currency. What exactly is an ambidextrous enterprise? Put simply, an ambidextrous enterprise is one that uses two business models simultaneously. One is its traditional model, while the other is its response to competition and environmental changes. Before we can properly understand the concept of the ambidextrous enterprise, we need to first understand what a business model is. One definition of a business model is the way a company develops, delivers and captures value. In other words, it is a company’s formula for transforming team, product and management into revenue, profits and profitability for shareholders. It is how an organization generates value for its key stakeholders. A large company usually develops complex structures over time, based on standards and procedures, in order to improve efficiency. Because of this search for operational efficiency, a collaborator is conditioned to follow rules, procedures and routines and is penalized for trying to do something other than what has been determined. For this reason, each industry has working standards and controls that must be rigorously met, since they represent important efficiency metrics, put in place to keep the business operating satisfactorily. How is innovation possible, while maintaining operational efficiency? The business as it exists today must tirelessly pursue efficiency, quality and consistency. Innovation, then, must originate in another organization, a parallel organization governed by a different set of rules, which will enable it to do what the former cannot. In a simple analogy, ambidextrous companies have the capacity to act with two hands: the right, which preserves the business in its present state, its “extractive culture,” operating without major transformations; totally different and separate from the right, including physically, is the left hand, which has a culture that can be called “exploitative.” And this is achieved in an integrated way. Ambidextrous companies are, therefore, the solution for ensuring the effectiveness of the existing operation, the responsibility of the right-hand side, the extractive culture, while seeking and managing innovation through the left-hand side, the exploratory culture. When innovations are tested, evaluated and approved on the left-hand side, they are then structured and implemented, with appropriate adjustments and precautions, in the right-hand organization. It is the discreteness of the two structures that enables the coexistence of activities of disparate, even conflicting, natures. This parallel organization will seek to incorporate advances in the management of people more compatible with a culture of innovation, including adopting flexible working hours, doing away with timecards and uniforms, and possessing a more fluid hierarchy. Collaboration is encouraged, as are experimentation, testing and errors — which are treated as learning opportunities. There are no boardrooms, and the office layout is of the open-space type, often a single large area with no partitions, which facilitates communication, interaction and cooperation. The framework is lean and highly flexible, accommodating a diverse set of project teams that replace functional departments and organizational charts. In order to ensure the coexistence of both business models, indeed both cultures, enterprises need to reflect on five issues, according to research conducted by Professors Constantinos C. Markides and Daniel Oyon of the London Business School and HEC Lausanne. Should I enter the market developed by the new business model? When entering the new market, should I use my existing business model or do I need a new model? If a new business model is necessary to exploit the new market, should I adopt an invasive / disruptive model? If I develop a new business model, how organizationally distant should it be from my current model? 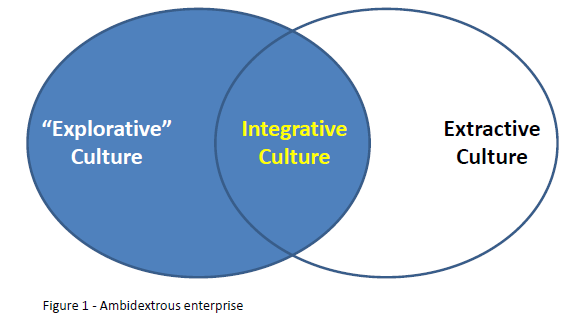 Once I have structured a separate unit, what are the challenges of reconciling the two business models / cultures, of operating them simultaneously? While there may be other ways to implement a culture of innovation in an enterprise, the ambidextrous organization is undoubtedly the most suitable and rapid of innovation strategies — and, thus, used increasingly by companies the world over.